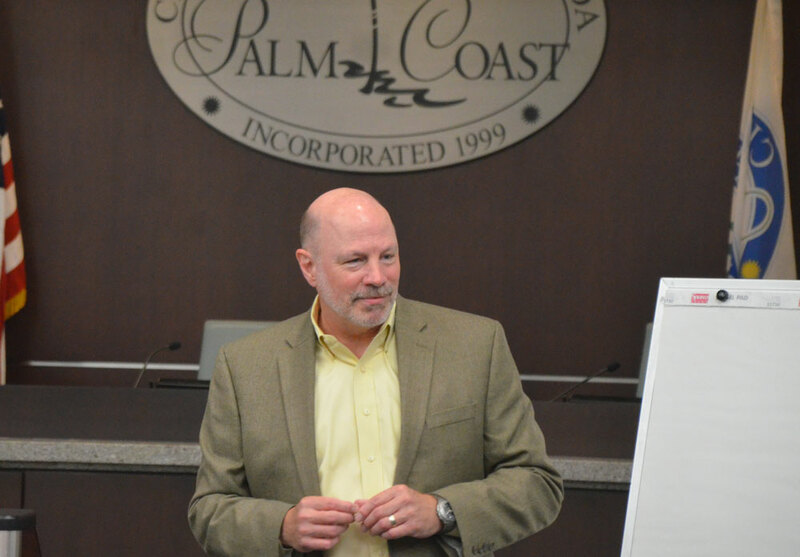 Palm Coast City Council members this week put down their markers regarding the sort of city manager they want to hire more clearly than they have in the months they’ve been talking about it. At least a few sharp lines and differences were drawn between council members, and they had nothing to do with the two members who joined the council last month. Rather, the differences were between the approach of Mayor Milissa Holland and Council member Bob Cuff: she wants a radical break from predictable, cookie-cutter candidates, he wants someone who can “make the trains run on time.” (Cuff was satisfied with ex-Manager Jim Landon in that regard. Holland was not.) She wants a hiring process rigidly controlled by the council, with little to no interaction with city staff in so far as candidates are concerned. Cuff sees the interaction as essential, because he wants his staff’s feedback in that regard. And Holland wants every part of the process to be open and transparent. Cuff in the past had no opposition to one-on-one meetings with candidates. For Cuff and Holland, who ran as allies two years ago, the differences appear to modulate or round the edges of each of their positions rather than alienate either from the other, producing a pragmatic synthesis in the search method their head-hunter is implementing. But it’s no less clear that Cuff does not intend to yield to Holland rather than check and balance her strong approach, if with none of the gruffness and irritability–or unpredictability–with which former council member Steven Nobile used to disagree with colleagues. The help-wanted ad for a new manager went live this week and will be up for the next 30 days–running into the thick of the holiday season. That starts a clock that should wind down with a new manager sometime in late winter or early spring. Council members discussed the process at their meeting Tuesday. 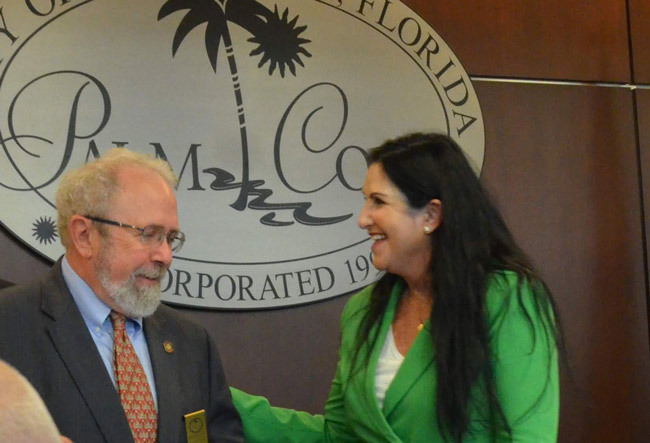 The new council members–Jack Howell and Eddie Branquinho–contributed little, spending most of the time listening and offering only passing thoughts. 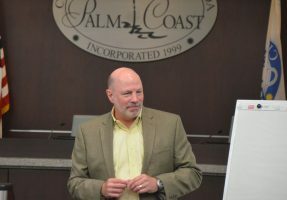 Doug Thomas, senior vice president of Strategic Government Resources, the head-hunting firm Palm Coast hired, led the discussion, but it was framed by Holland and Cuff, and, to a surprising extent, by Flagler County Administrator Craig Coffey: he wasn’t there, but going through the steps of hiring him in 2007, when she was a county commissioner, so colored Holland’s experience with the process that she was still smarting from it, and reacting in opposition to it with regards to how she wants the Palm Coast manager’s hire to go. (She had voted against hiring Coffey.) Cuff, of course, never knew Coffey and has never gone through a municipal executive’s hire. One of the questions Holland asked candidates in the county process, she recalled to her council colleagues, was “what do you know about me.” The response from one of the candidates–who turned out to be Coffey–was: “I heard you were high maintenance.” The line has stuck with Holland over the years. Holland told the story at Tuesday’s meeting without attaching a name to it. She was reacting to one of Thomas’s proposals that the short-listed candidates for city manager be given the opportunity to tour city facilities, perhaps with city staff, to get to know staffers and get a feel for what’s ahead. Holland was opposed to that approach. She described her 2007 experience at the county. Holland wants a mold-breaker, Cuff wants someone who makes the trains run on time. Cuff gently but very firmly disagreed with Holland. Cuff was sending a message to his colleagues, if not to city staff, that he is not interested in major turn-over in the post-Landon era, though of course that will be the new manager’s prerogative, not the council’s. But it could also be another signal of Cuff’s support for sticking with Beau Falgout, the interim manager who used to be Landon’s deputy. Cuff has spoken that support previously. Holland and Cuff also diverged on how radically different they want the next manager to be. The subject came up when Thomas was discussing where the position is being advertises. Cuff had no issues with the list of outlets. “The verbiage looks fine. I’m a little surprised you left out the ‘walks on water,’” Bob Cuff said with his usual wryness. He’s focused on finding someone who can run the less than glamorous nuts-and-bolts aspects of a city–keeping the swales operational, the roads paved, the water utility working, the garbage trucks upright. That had been one of Landon’s strengths, albeit at the cost of a wanting imagination. Thomas sought to reassure her, and agreed to include several suggestions on advertising venues from council member Nick Klufas. “I see thousands of resumes,” he said. “We will attract both kinds, you’ll have the traditional candidates, the non-traditional, and then you’ll probably have a bunch of candidates who have no business applying but they say, hey, I want to be a city manager.” He will be seeking out candidates through advertising and his own contacts, plus a newsletter that goes to over 40,000 people in local government, including elected officials. SGR drafted a glossy, nine-page brochure (see below) that could in a different context just as easily work as a marketing brochure for retirees or young professionals or couples starting a family–or individuals in the witness-protection program (Palm Coast has had its share). The last part contrasts with former manager Landon’s profile, which did not match up with that description. “The brochure is intended not to be all-inclusive. What you want is to whet the appetite of the candidates and encourage them to reach out and contact me or to learn more about the community,” Thomas said. In 30 days, Thomas will sort through the applications and triage them down to a smaller batch, throwing out the outliers. There’ll be a special meeting with the council to further reduce the applicants to an initial shortlist. Candidates will then have to answer questionnaires of some two dozen questions about their background, why they left their last position, whether they have any controversies to disclose, their desired pay. SGR will conduct background checks on them. The candidates will also submit to a video interview conducted by SGR. Council members will then have a briefing book collecting the lot, and decide at another meeting who to bring in for interviews. There was a possibility of holding one-on-one interviews between the candidates and the council members. Holland was not keen on that idea, nor were Howell and Klufas, wanting a more open process to hear each of the council members’ perspectives. “There’s no doubt in my mind you’ll attract a very qualified pool,” he said. See below for the job posting and the nine-page brochure circulating among applicants. The job posting, live here. Boasting beautiful natural vistas and endless recreational opportunities, the City of Palm Coast is situated on 96 square miles along saltwater and freshwater canals and the Intracoastal Waterway in Northeast Florida, just minutes from pristine Atlantic Ocean beaches. One of Florida’s newest cities, the growing, dynamic community of 86,516 provides a full array of municipal services with 450 full-time, 4 part-time, and 70 seasonal/temporary employees with a budget of $143.7 million. The city operates under the council-manager form of government with a Mayor & four Council Members. The successor City Manager should have a demonstrated track record of resourceful, entrepreneurial approaches to development, willing to consider creative strategies to address high-growth community issues and challenges and have a sense of vision for both the organization and community that will ensure sustainable future growth. The ideal candidate must hold a bachelor’s degree in public administration, business administration, or a related field; a master’s degree is preferred. A minimum of eight years of progressively responsible experience in a City Manager’s office or as a Department Head in the management and administration of a municipal government is desired. Any combination of education and experience that provides the required knowledge and skills will also be considered. The final selected candidate shall establish residency within the corporate limits of the City within six (6) months of appointment. Once again the city officials missed the mark in their job posting. Having served in an administrative position in the past, if I was a candidate looking at this job posting, red flags would go up concerning the verbiage about “personality traits”. The first thing I would wonder about is what is going on in that town? And I would probably surmise that the powers that be must be difficult to work with and that there are real issues that exist that would make the work environment difficult, to say the least. I understand the concerns regarding past experience with Mr. Landon, but I believe that the need for a different management style could be investigated and explored by the recruitment firm during the interview process. Although human resource offices are only allowed to discuss general information when discussing employee performance, there are many other avenues to gather intel on candidates and their work and community relationships. I am also disappointed in the educational requirement. I believe that this community does not necessarily need a person with a business degree. What we really need is a person with a Master’s Degree in City and Community Planning. Although a business background is desirable, we really need someone with a wide range of skills in city planning. I really doubt that someone who has a business degree will be the type of person we sorely need in order to move this community forward. We don’t need another “manager”. If that is what they are aiming for, then they are setting the bar way too low. A city planner looks at the whole picture, plans, organizes, and delegates. This happened to be the opportunity to do a “reset” and scrap everything that was dysfunctional about the current city organizational model. Once again the council and mayor have missed the mark. I forsee the same old model repeating itself with just a different face. What a missed opportunity! The other night at the City Council meeting I listened intently to the parameters being set by SGR. I would very much like to see someone with a Masters Degree in city planning. However, I just don’t look at the degree as the major qualifying factor. I want to see the work history and experience as a city manager. I also want to see leadership traits and communication ability. Trust me, I will not support another Jim Landon type persona. I served as a member of the recent Flagler County Search Committee for the Superintendent of Schools. And, I would very much like to incorporate citizen input with this selection process.